Signing books (Italian translation, Einaudi) after a talk at Palazzo Someda, Fiera di Primiero, Italy, in August 2009. 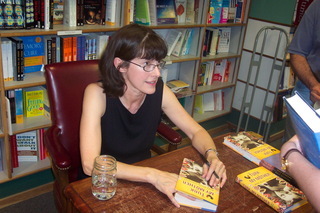 Signing books at Prairie Lights in Iowa City. 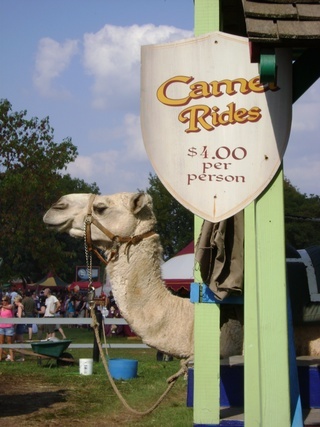 Photo by Linda Schuchert. Reading at the Bookworm in Omaha, Nebraska. Photo by Amelia Ramirez. 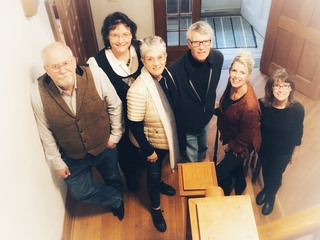 These happy campers took part on November 2-4, 2018, when Mary Helen (far right) taught a weekend course called "History, Imagination, and Truth: Bringing Real Life into the World of Your Stories" at the Iowa Writers House in Iowa City. For more information about future events and workshop opportunities, click the Iowa Writers House above. Contact Mary Helen via this website to set up a visit--in person, by phone, Skype, email--for your book club, library, or festival. Or email mhstefaniak@yahoo.com. On Thursday, September 27, AAUW-IA's eNetwork branch hosted an online discussion with author and branch member Mary Helen Stefaniak about the many stories behind her novel, The Cailiffs of Baghdad, Georgia, an AAUW ¡Adelante! Book of the Month Club selection, in which you can learn about white dirt, Milledgeville GA, 9th-century Baghdad, a one-woman doctor without borders from Tennessee, and Bilali Mahomet, perhaps the most famous of the African Muslims enslaved in the American South. For more information, email mhstefaniak@yahoo.com.